Booth prices vary. Contact Kim Bosher for booth information. Tickets are free for Chamber members, $5 in advance or $10 at the door. 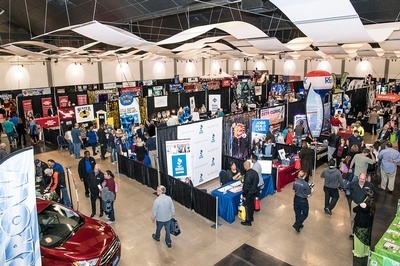 Business Expo is the Abilene Chamber of Commerce’s annual high-energy, high traffic trade show, attracting about 7,000 businesses and consumers in a dynamic business-to-business atmosphere. Presented by the Abilene Business Council, this signature event of the Chamber is a great opportunity to gain new leads, customers, and to give your brand visibility in the Big Country marketplace. It is also an ideal venue to introduce a new product or service, or reacquaint the business community with your company. 11:00 am - Food Trucks open - Exhibitor Lunches available sponsored by Taylor Electric Cooperative, Inc.
4:30 pm - Join us for Business After Hours sponsored by – First Bank Texas, Market Street and Reed Beverage featuring the Live Auction sponsored by LMB Property Group and Booth Awards sponsored by JAR Land Investments. Chamber members who attend will be entered to win a Smart TV donated by BNI West Texas. Booths are sold out! Contact Kim to be put on the waiting list. Thank you to the many sponsors who help make Business Expo possible!